INDIANAPOLIS - Jaclyn Fenwick claims she didn't know much about the legislative process or what she wanted to do in the future. That's all changed for the Indiana State University senior public relations major from Vincennes who says she dreams big. "I've definitely been bit by the political bug. I love coming here," she said. "It's opened doors for me and I've put my foot in the door. I want to be a state legislator." Fenwick is one of four Indiana State students and alumnae who worked as in intern during the 2010 Indiana state legislative session. She served with the House democrats. The other three students worked in the Senate. Kendra Lindsey, a sophomore financial services major from Bicknell, interned with Sen. Phil Boots, R-Crawfordsville and Sen. Jean Leising, R-Oldenburg. Kelly Flynn, a December 2009 psychology graduate from Monrovia, interned with Sen. Earlene Rogers, D-Gary, and Sen. Richard Young, D-Milltown. 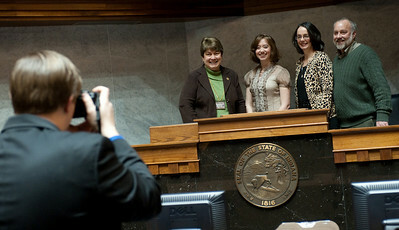 Analyssa Noe, a December 2009 graduate in legal studies from Wetmore, Kan., interned for Sen. Vi Simpson, D-Ellettsville. "The State House internship program is invaluable for students who are interested in politics because they are given an opportunity to see how laws are made - or how bills are defeated, often for political reasons," said Michael Chambers, chair of the political science department. "This gives students some amazing, behind-the scenes views of one of our most basic political institutions." Interns work with the legislators tracking bills, helping constituents with other government agencies, writing letters and putting together bill packets. For Lindsey, the experience has only furthered her love of politics. "I don't know why but I was four years old and interested in the presidential race," she said. "The thing I love is it's ever changing. I never know what's going to happen during the day. I make a to-do list for the day and then there are days I don't get anything on it done." Lindsey, who plans to attend law school and either practice law or become a lobbyist, said that politics is something that people become passionate about. "When I talk to people about why they enjoy politics, they're not sure why but once they get involved they just can't stop," she said. Noe, who also interned at the 2008 Democratic National Convention, knows why she enjoys working in politics. "These are things that affect lives. The decisions they make right now will affect people 10 to 20 years out," she said. "When you see things in a community you want to be better, you have to know how politics work. It opens doors to changing things, making things better." During her internship, Noe was selected as the Senate Democratic Caucus Intern of the Year. With that, she received a $3,000 scholarship she plans to use in working toward a master's degree in business administration. "I am pleased to represent Indiana State University with this award, but maintain that my success is rooted in the experiences, mentoring and preparation that I received while I was at State," she said. Flynn said she thought her education also prepared her for her internship. "The whole of my education prepared me for it - to write well, to speak well, to behave professionally," she said. "It comes from my whole experience as a student." Flynn used her internship as a transition between finishing her undergraduate degree and beginning law school in the fall. She used her internship to explore a different type of law. "I realized I didn't know much about the legislative branch," she said. "I thought at the least I would be a well-informed person and I might find something I want to do." She also found that she could practice law through Legislative Services Agency or working as a caucus attorney. "There are different ways to practice law," she said. "You don't have to be a trial attorney." She now plans to attend law school and explore different types of law to see which one she enjoys most. From discovering a new career to exploring options for practicing law, each of the interns learned during their semester away from Indiana State. "Most of our students take courses in state and local politics or on Congress and the legislative process, and this internship experience allows them to see what really happens and compare it to what is described in their text books," Chambers said. "This type of hands-on experience is a fantastic experiential learning opportunity for our students." 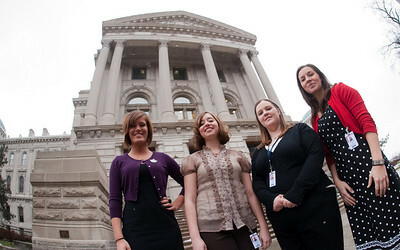 Two Indiana State students and two December 2009 graduates spent the spring semester interning during the Indiana legislative session.